Full-on deforestation is a major environmental problem, but what about seemingly less impactful changes, like forest degradation and disturbance? A new study published today in the journal Science finds that these less eye-catching human impacts are more harmful than has been assumed, and are actually causing tropical forests to now emit more carbon than they capture—making them a carbon source rather than a carbon sink. When forest is removed entirely—often to be replaced with agriculture or some other form of development—that’s deforestation. When a few trees are cut for logging or firewood, that’s degradation. Disturbance is a natural driver, such as drought or wildfire. According to the study, this is the first time scientists have been able to account for these more subtle natural and human-caused losses while also measuring gains from forest growth. And while the trend is worrisome, it also leaves room for hope, as forest restoration is often much easier on degraded or disturbed lands than it is on entirely deforested areas. Baccini said that until now most of the focus in understanding whether tropical forests were carbon sources or sinks was linked to deforestation, leaving the more minor human impacts and natural disturbances out of the picture. But these minor impacts can add up quickly, it turns out, and change the big picture quite dramatically. Using these techniques, they determined that tropical regions emit about as much carbon dioxide annually into the atmosphere as do all US cars and trucks—a net total of about 425 teragrams. Gross annual losses were about 862 teragrams of carbon, while gains were approximately 437 teragrams of carbon. Thus, according to the study, ending tropical deforestation and forest degradation would reduce annual emissions by at least 862 teragrams of carbon, or about 8% of annual global emissions. So if all deforestation and degradation in the studied tropical regions was stopped, tropical forest regions would easily become carbon sinks again. In Brazil, where research into forest loss is extensive, losses in carbon density in the early 2000s reflected a documented deceleration in deforestation, due to reductions in soy and cattle production, better monitoring and enforcement, new fines and embargoes, and new protected areas, according to the study. Increases in forest loss after this period are increasingly attributable to forest degradation, and “are responsible for the upward trend in carbon density” late in the data series. 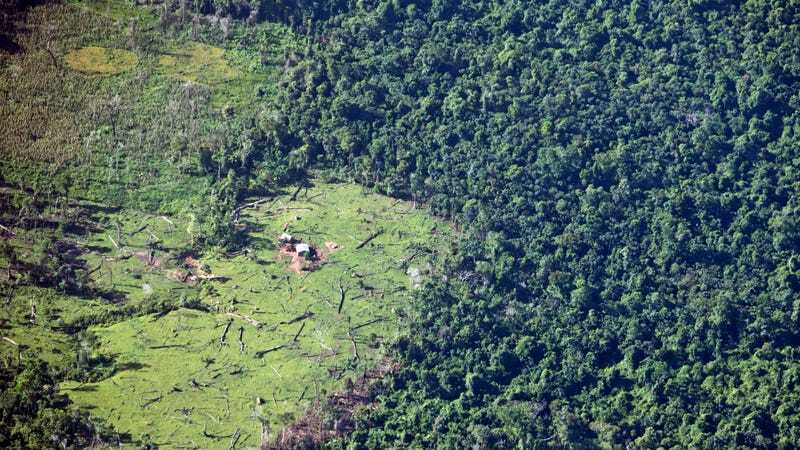 Some 60% of the overall carbon “losses” during the study period occurred in Latin America, where the world’s largest rainforest, the Amazon, is picked away at year after year by economic development. Another 25% of the losses came from Africa. In the Americas and Africa, the majority of these losses were due to degradation and disturbance, not deforestation. Some 70% of losses were due to degradation and disturbance in the Americas; in Africa, it was 81%. There were also considerable forest gains across the tropical belt, with nearly 43% of these gains in the Americas and 30% in Africa. Nonetheless, even as tropical forests regrow rapidly and took in carbon, reductions in “carbon density” in standing forests accounted for around 70% of the overall carbon loss, with losses exceeding gains on every continent. David Pearson, a professor in the School of Life Sciences at Arizona State University who did not participate in the study, warned against over-interpreting the results, saying that there’s no simple way to “incorporate and separate out” all the changes going on simultaneously in tropical forests. Despite this complexity, or perhaps because of it, Baccini believes the global climate change community needs to focus more on degradation and disturbance and not simply deforestation. “If you address only the issues of deforestation, given the results of this paper, you are going to miss quite a lot,” he said. And one wouldn’t be missing just sources of carbon emissions, but also relatively easy solutions to slowing carbon losses.